Singapore Airlines wing fire caught on video; Brexit fallout continues; 'Crying Messi;' Clinton, Warren to campaign in Ohio; Inside Intel's in-house creative team; Sanders press secretary calls it quits. The wing of a Singapore Airlines flight caught fire after making an emergency landing. (Image via BNO News' YouTube account). 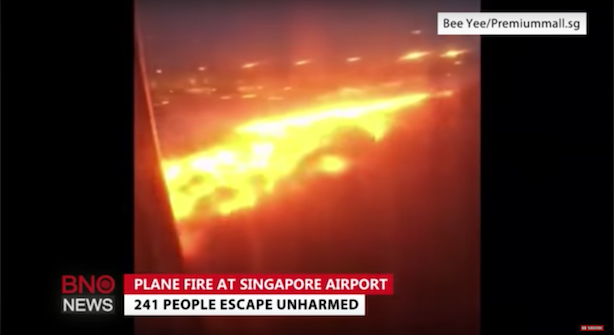 Singapore Airlines trended on Twitter on Monday morning after a passenger shot video of his plane’s wing catching fire after it landed in Singapore after cutting short a planned flight to Milan. No passengers or crew were hurt. The fallout from Thursday’s Brexit vote continued Monday morning. The U.K.’s finance minister tried to calm the markets, but the pound tumbled anyway. Leave activists backpedaled on some Brexit promises this weekend. HSBC said it will move 1,000 jobs from London to Paris. Meet "Crying Messi." The meme emerged Sunday night after the Argentinian striker missed a crucial penalty kick that allowed rival Chile to best his team for the Copa America title. Messi said shortly thereafter that he’s retiring from international play. The F.C. Barcelona star was ranked number two on Forbes’ 2016 list of the world’s highest-paid athletes. Hillary Clinton and Elizabeth Warren will hit the campaign trail together for the first time on Monday in Ohio amid heightened VP speculation. Clinton, who has a double-digit lead over Donald Trump according to a Washington Post-ABC News poll released this weekend, unveiled an ad criticizing Trump for his golf-course-focused response to the Brexit vote. In the past week, Trump has sent his first national fundraising emails and rapid-response messages, and his team took the wraps off a website featuring what it says are lies told by Clinton. Intel has built a sizable in-house advertising team known as Agency Inside, a play on its longtime tagline. The group, set to have 90 employees by the end of this year, is focused on telling the story of what the company does in the post-PC world, according to a New York Times profile. National press secretary Symone Sanders has quit Bernie Sanders’ still-sort-of-existing campaign. The Vermont senator, who has been mathematically eliminated from winning the Democratic nomination in any traditional sense, has said he will vote for Clinton in the general election, but hasn’t made a straightforward endorsement.